The HESA electronic publication Destinations of Leavers from Higher Education Institutions 2010/11 is published today. The publication provides detailed results of the DLHE survey, which asks UK and EU domicile graduates what they are doing six months after graduation. 63% of full-time first degree graduates reported that they were in employment only, with a further 8% both working and studying. 16% were in further study only and 9% were unemployed. Of those full-time first degree graduates who entered employment (including those both working and studying), 69% were employed in full-time paid work, 22% were employed part-time, 5% were self-employed or freelance and 4% were in voluntary or unpaid work. 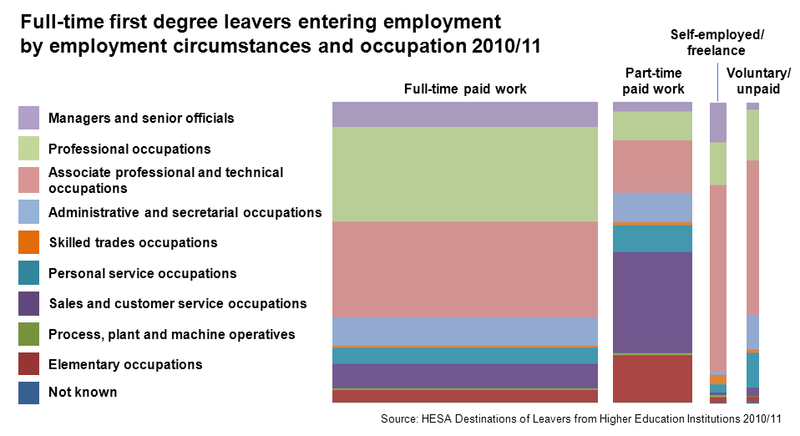 The graphic below shows the occupational classifications of full-time first degree leavers who entered employment. The greatest proportions of leavers (45% of all full-time first degree leavers) entered managerial, professional or associated occupations, although those in part-time work were more likely to be in sales or customer services. Destinations of Leavers from Higher Education Institutions 2010/11 includes detailed coverage of the DLHE survey results, including analysis of data by mode and level of study completed, further study after graduation, and industrial and occupational classification of employment. Destinations of Leavers from Higher Education Institutions 2010/11 is available as an electronic publication for purchase and immediate download from our website. More results of the 2010/11 DLHE survey can be found here. Details about the HESA Destinations of Leavers from Higher Education survey can be found on this web page. A full list of the occupation codes included in the published grouping can be found here.